Noblemania: “Bill the Boy Wonder” book giveaway—win in six words! 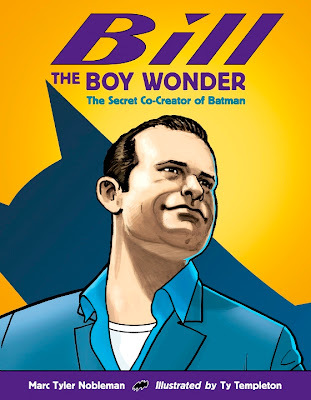 “Bill the Boy Wonder” book giveaway—win in six words! So let’s count down with a contest. Anything other than six words is ineligible. Important: Please either include your e-mail address or e-mail me separately (my e-mail is at top right) repeating your entry; if I cannot reach you, you cannot win! If you are competitive, please spread the word! The deadline is June 30, 2012 at 11:59 p.m. EST. Winners will be announced here on July 1. Books will be sent the following week. And hopefully Bill’s story will be shared forevermore. Bill Finger gave Batman his voice. Bill Finger: His hand wrote Batman. Bob Kane took all the credit. Batman's identity unmasked by Bill Finger. "Not credited, but also not forgotten." A genius beloved, yet nearly forgotten. Without Bill, Batman's parents would live. Bill's chiroptophilia improved human life exponentially. Great unsung tinker? Surely Bill Finger! Oh, and my email address is kristian9k AT gmail.com in the unlikely event that I win. Na Na Na Na Na...FINGER! Bill Finger: Batman, Green Lantern, more. "He gave the Bat his wings"
The real boy wonder to Batman. Forgetting: easier than remembering. Always remember. Finger book reveals Batman's secret histories. Bob Kane's secret identity: Bill Finger. Kane concealed his most important Finger. Without Finger Batman would be unrecognizable. Without Bill Finger Batman would not be what he is today. I couldn't figure out how to email you my entry but just encase its eric.nusbaum421@gmail.com and my sweeps entry is a few comments above this...and Thanks for this awesome opportunity!!! Legendary storyteller of iconic comic hero. Bill Finger is the REAL Batman. DC, stop giving Bill the finger. Without Bill Finger, Batman't just pictures. The difference between pictures and stories. Marc Rightly Finger'd Kane Robin' Bill. Never pointed fingers, fans should know. Murderer of Thomas and Martha Wayne. Bill Finger is Batman's "other" dad. Winners have been announced here: http://noblemania.blogspot.com/2012/07/three-winners-of-my-bill-finger-book.html. Thank you to all entrants. One of the winners did not provide an email address, so please do or else I cannot send your signed copy!